I am lucky enough to have an old grapefruit tree which faithfully produces fruit every winter. But something strange seems to happen as every two years it seems to go completely mad and is totally overloaded with fruit. It’s one of those years. So I need to find recipes to use up at least some of the delicious tangy fruit. Going sugar free has meant I don’t make marmalade and even if I did, I generally don’t have gluten-free toast to spread it on. Fruit juice is out so I try and give away as much as I can, but there is still a lot that ends up in the compost bin, awful I know! It was pretty awesome to find Swiss Paleo’s recipe – Roasted Salmon with Grapefruit Basil Sauce. Grapefruit as so super healthy and we all know the health benefits of regularly eating fish, like salmon, all those Omega 3 fatty acids. Salmon is a fairly rich fish so pairing it with a tangy, citrusy sauce is perfect. A big thanks to the Paleo Gang at Swiss Paleo. 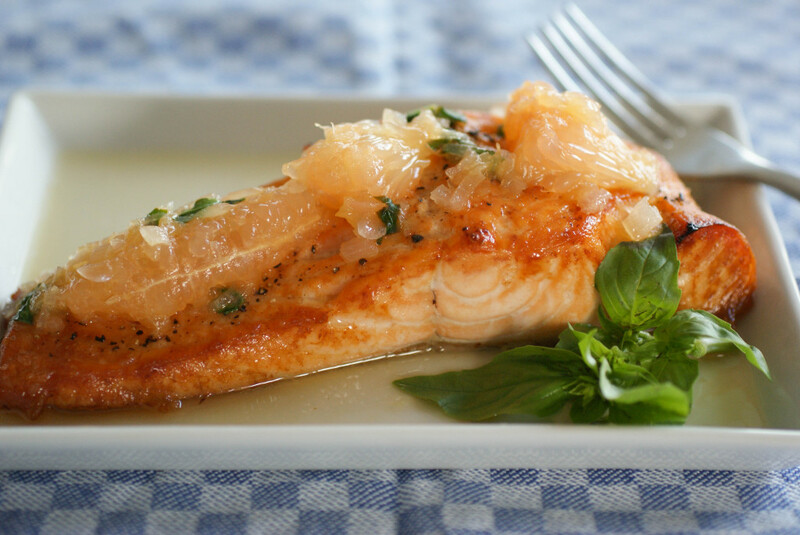 This link will take you over to the recipe Roasted Salmon with Grapefruit Basil Sauce. If you can’t get grapefruit then try lemon or lime – both with give the fish a lovely zesty tang. Glad you enjoyed it! Grapefruit is my absolute favorite fruit and I would kill to have my own tree! There are so many in Auckland, New Zealand we get very complacent about them!